Mud Fever, or Pastern Dermatitis, is a bacterial skin infection affecting the lower limbs of horses. It is most common in winter and early spring when wet and muddy ground conditions facilitate the perfect environment for bacteria to thrive. The infection is chronic, progressive and needs to be treated before it moves further up the leg. Mud Fever is known by different names i.e. Rain Scald, when it affects other parts of the body. It is characterised by red, painful sores or ulcers that mainly affect the pastern and heel area of the foot. The sores scab over, cause hair loss and produce a malodorous discharge. For some reason, feathered breeds and non-pigmented skin tends to be more severely affected. When the weather is consistently wet and the ground is churned up and muddy, horses’ hooves can fare very badly out in the field. Constant moisture, along with repetitive trauma to the hoof from grit, mud and sand, can compromise the integrity of the epidermis and leave it open to bacterial invasion. Ordinarily, the skin provides adequate protection against harmful pathogens gaining entry, although perpetual wetting of the skin can weaken it to the point of breaking. When this happens, bacteria move into the open wound and multiply. Breaking of the epidermis is also assisted by mud and sand abrasion when a horse is constantly turned out or schooled on sand. Other times, hard or dirty bedding can cause physical trauma to the foot, leaving it open to ulceration. Any injury to the lower limb that is not immediately treated can quickly become infected when exposed to dirt. The types of bacteria that cause Mud Fever typically include Dermatophilus congolensis, Staphylococcus, ringworm (Dermatophystosis) and mange mites (Chorioptes species). As with any bacterial infection, if it isn't dealt with straight away, it can quickly advance into something much more serious. In these severe cases, antibiotics or antifungals may be prescribed to treat the infection. Although there is differing opinion on the matter, many people think of Mud Fever as a contagious condition that can be transmitted between horses through direct contact. If boots, wraps and grooming supplies are shared, the causative organisms can be spread, which is particularly hazardous for horses with existing abrasions. For this reason, it is important to maintain complete hygiene when treating a horse for Mud Fever. What are the symptoms of Mud Fever? Recognising Mud Fever is fairly easy when you know how. It is important to keep a regular check on your horse’s feet every 1-2 days, especially as we come into winter. Be aware that constant wetting of the hooves is a leading cause of Mud Fever, so it is always better to allow mud to dry before brushing it off. Avoid hosing your horse down unless you intend to dry it thoroughly afterwards. 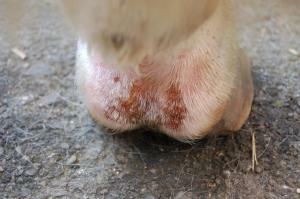 Symptoms of Mud Fever tend to develop on the pastern and heel areas of the foot. The first signs you will probably notice will be redness, inflammation and crusting. Beneath the scabs will be moist, pink sores, lesions or ulcers that produce a discharge (often white, yellow or greenish in colour). The hair surrounding the sores will be matted or lost. The area may feel hot and swollen, and your horse may show visible discomfort when placing pressure on the affected limb. If Mud Fever isn’t treated quickly, lameness can occur. A severely affected horse may also display lethargy, depression and loss of appetite. As with most things, prevention is often better than cure and, bearing in mind that Mud Fever can sometimes be difficult to treat, it is worth taking the necessary precautions to prevent it from happening in the first place. Once a horse has experienced one bout of Mud Fever, it is likely to experience more in the future. First of all, it is important to keep your horse's feet as clean and dry as possible. Horses that are routinely stabled are much less likely to develop Mud Fever, providing their stable bedding is kept clean, dry and non-irritating. Those that are turned out are more at risk, especially if they stand in boggy conditions 24-hours a day. Avoid wrapping the feet in bandages as the minute your horse is turned out, these will quickly become sodden and will effectively keep the skin wetter for longer. The best option is to thinly apply a barrier cream to the area before your horse is turned out e.g. udder cream, castor oil or petroleum jelly will do the job nicely. Always ensure the feet are clean and dry before doing this so that the skin is not overly moistened. After exercising your horse, be careful not to over-wash the feet and legs, even if they are caked in mud. It is best to wait until the mud has dried before brushing it off. After doing this, if you notice any small abrasions to the feet, apply an antiseptic as soon as possible and ensure that an effective barrier cream is used whenever your horse is turned out. If, however, your horse is already showing signs of Mud Fever, it is important to act quickly. Horses that are heavily feathered will benefit from having their hoof hair clipped (not shaved) to allow it to dry more quickly. The less hair there is for mud to cling to, the less severe the Mud Fever is likely to be. Also, as feathered hair traps moisture, the shorter it is, the faster it will dry. On first noticing symptoms of Mud Fever, use an antiseptic wash to remove any moist scabs (not the dried ones!) and clean the area. In many cases, removing the horse from the field and keeping it stabled for a period of time is the only effective way of treating the condition. Once the scabs have been gently removed, the causal organisms beneath need to be dealt with. Mild disinfectants i.e. iodine wash, surgical scrub or even a medicated shampoo, need applying to the exposed area to treat the infection and, where possible, the sores should be left exposed to the air to dry out. Anti-inflammatory ointments should also be applied to problem areas to help reduce swelling and discomfort. This process will need repeating daily for up to a fortnight. It is vital that the feet are kept clean and dry at all costs, especially if the infection is severe and/or has progressed further up the leg. The use of bandages or wraps can be effective, as long as the skin beneath is treated before these are applied. If weather conditions are particularly poor, stabling may be your only option when it comes to ensuring the affected limb is protected.